At SPEA, we value the unique skills and experiences that our military students and student veterans bring to the classroom. Our master's degree and certificate programs are ideal preparation for your next leadership role in the military or for life after your military service. Our programs are designed to develop competencies for public work—complex problem solving in environments where leaders must use both hierarchical authority and lateral influence. Contact us to discuss how our programs can meet your needs. SPEA will waive all application fees for military and veteran students. SPEA will guarantee a reduction to in-state tuition rates for active duty and veteran students provided the applicant is not eligible for or not selected to receive an award through the Yellow Ribbon Program. Yellow Ribbon is administered by IU's Office of Veterans Support Services. SPEA will award a minimum 6-credit reduction for Prior Professional Experience (PPE) for those with at least two years active duty or full-time guard/reserve service OR four years part-time guard/reserve service. Up to a 12-credit reduction is possible if applicant can demonstrate significant managerial and leadership experience. Indiana University’s Veterans Support Services maintains a dedicated staff to provide personal support and assistance for military students and families. They are here to assist you with any student- or military-related concern. 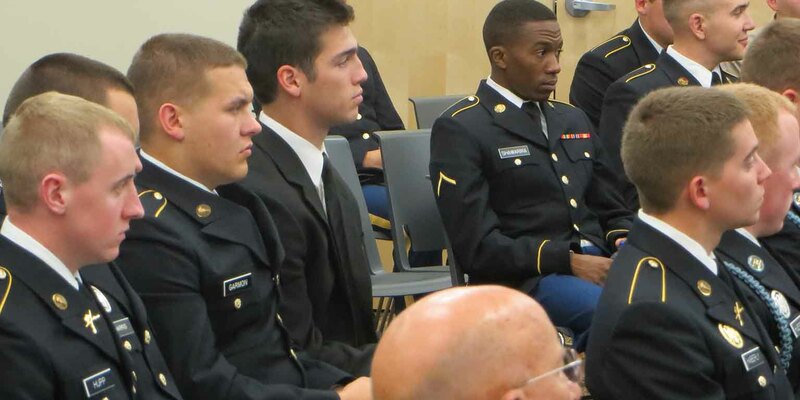 Indiana University also maintains flexible enrollment policies for military students. Recognize 6 credit hours of transfer credit toward the graduate level online Public Management Certificate. SPEA Salute to Service and education conference involving ROTC and military officials.